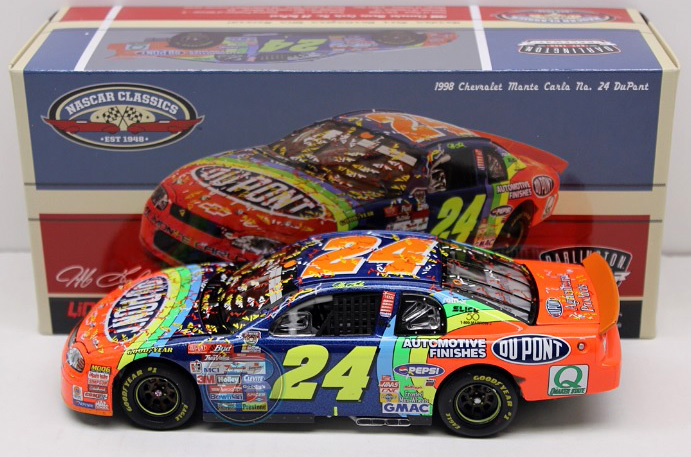 1998 Jeff Gordon #24 Dupont / Atlanta Win / Raced Version / Chevrolet Monte Carlo NASCAR diecast, by Action. 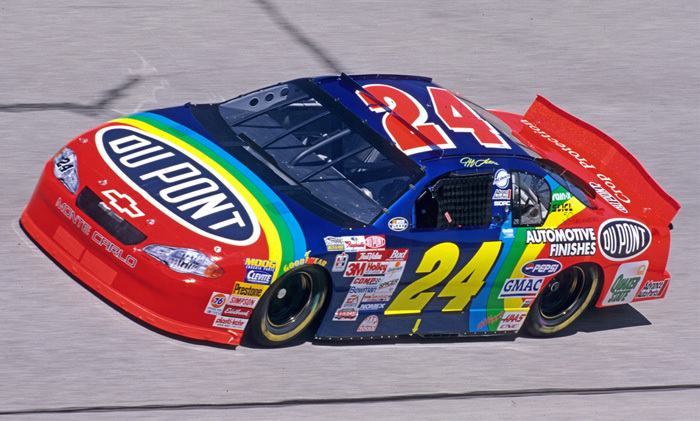 Jeff Gordon raced this Hendrick Motorsports #24 Dupont Chevrolet to victory in the NASCAR Winston Cup, NAPA 500 at Atlanta Motor Speedway on November 8, 1998. 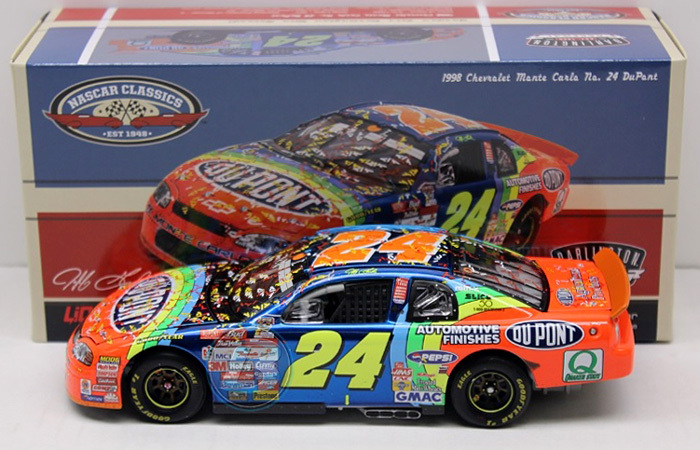 1998 Jeff Gordon #24 Dupont / Darlington Win / Raced Version / Chevrolet Monte Carlo NASCAR diecast, by Action. 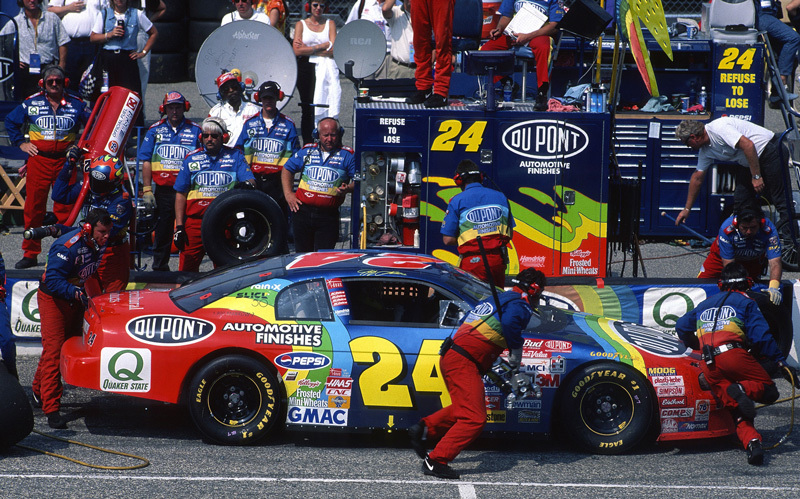 Jeff Gordon raced this Hendrick Motorsports #24 Dupont Chevrolet to victory in the NASCAR Winston Cup, Pepsi Southern 500 at Darlington Raceway on September 6, 1998. 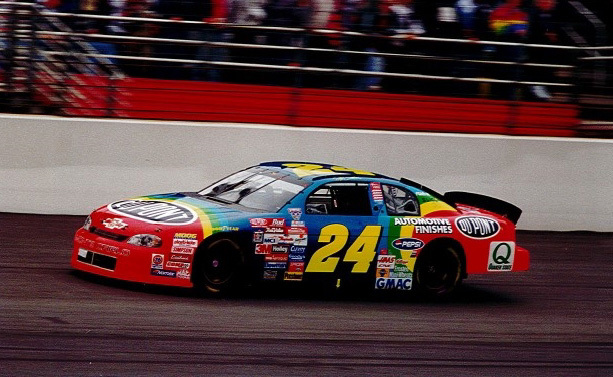 This was Jeff Gordon's 4th straight Darlington Southern 500 win. 2015 Jeff Gordon #24 AARP Drive to End Hunger / Chevrolet SS NASCAR diecast, by Action. 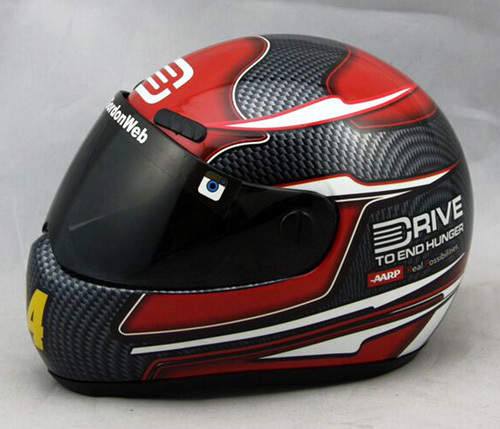 The Hendrick Motorsports #24 AARP Drive to End Hunger Chevrolet SS was raced by Jeff Gordon during the 2015 NASCAR Sprint Cup season. 2015 Jeff Gordon #24 AARP Drive to End Hunger / Daytona 500 Pole Winner / Chevrolet SS NASCAR diecast, by Action. 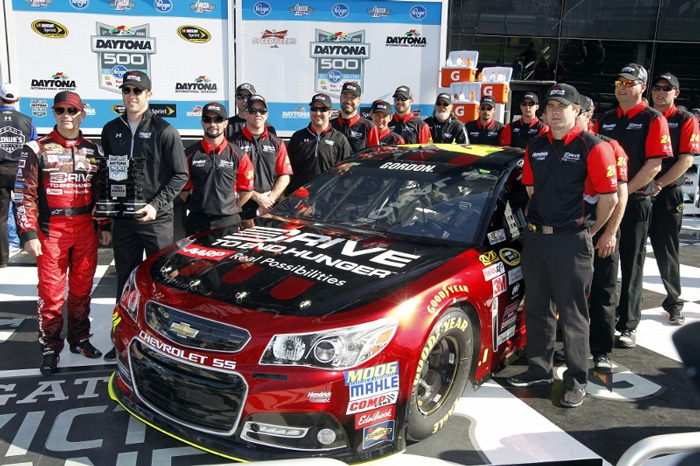 Jeff Gordon drove this Hendrick Motorsports #24 Drive to End Hunger Chevrolet SS to the pole position for the 2015 NASCAR Sprint Cup, Daytona 500 at Daytona International Speedway. This diecast car will look just as it did on track, including the Coors Light pole winner logo on the door panel. 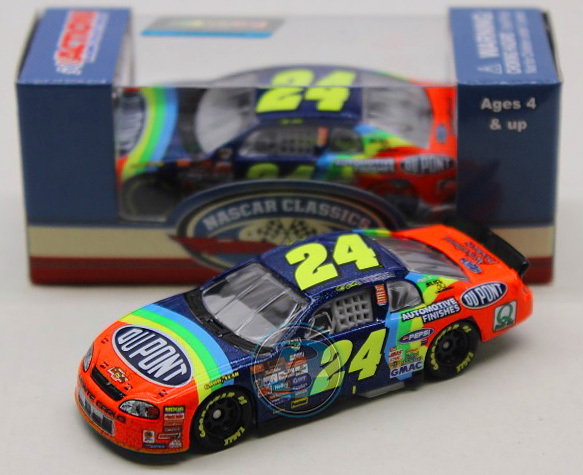 2015 Jeff Gordon #24 3M / Chevrolet SS NASCAR diecast, by Action. The Hendrick Motorsports #24 3M Chevrolet SS was raced by Jeff Gordon in select events during the 2015 NASCAR Sprint Cup season. 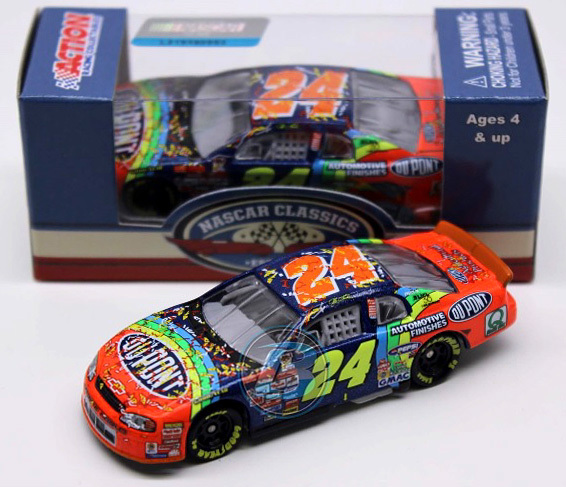 2015 Jeff Gordon #24 3M Race Day / Chevrolet SS NASCAR diecast, by Action. 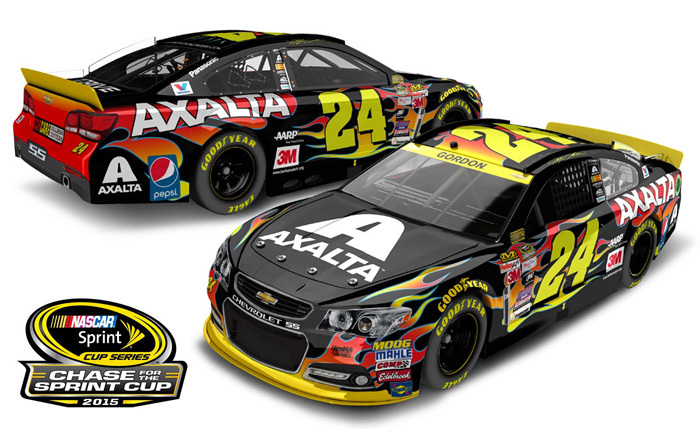 The Hendrick Motorsports #24 3M Race Day Chevrolet SS was raced by Jeff Gordon in select events during the 2015 NASCAR Sprint Cup season. 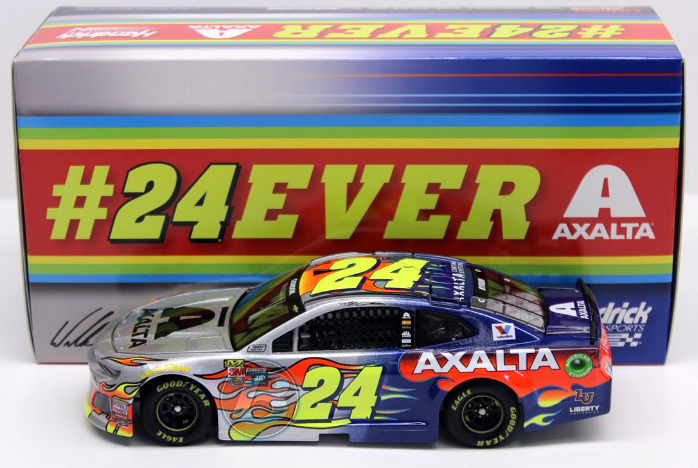 2015 Jeff Gordon #24 Axalta Fix Auto / Chevrolet SS NASCAR diecast, by Action. 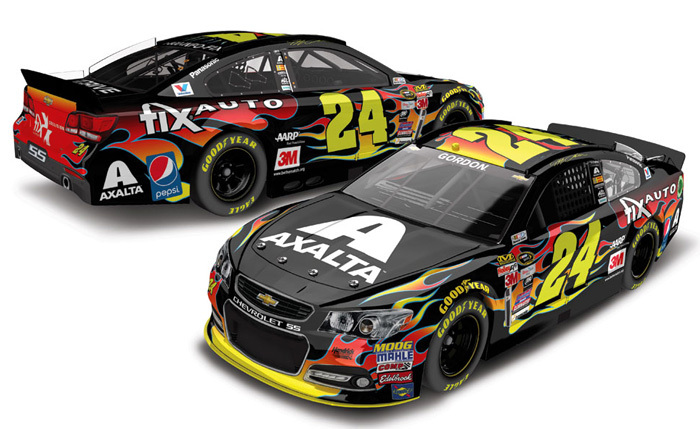 The Hendrick Motorsports #24 Axalta Fix Auto Chevrolet SS was raced by Jeff Gordon in the NASCAR Sprint Cup, Auto Club 400 at Auto Club Speedway (California) on March 22, 2015. 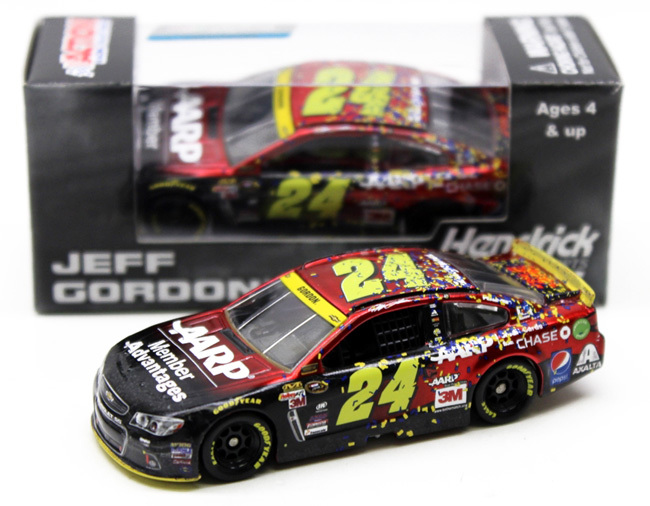 2015 Jeff Gordon #24 AARP Member Advantages / Chevrolet SS NASCAR diecast, by Action. The Hendrick Motorsports #24 AARP Member Advantages Chevrolet SS was raced by Jeff Gordon in 6 events during the 2015 NASCAR Sprint Cup season. 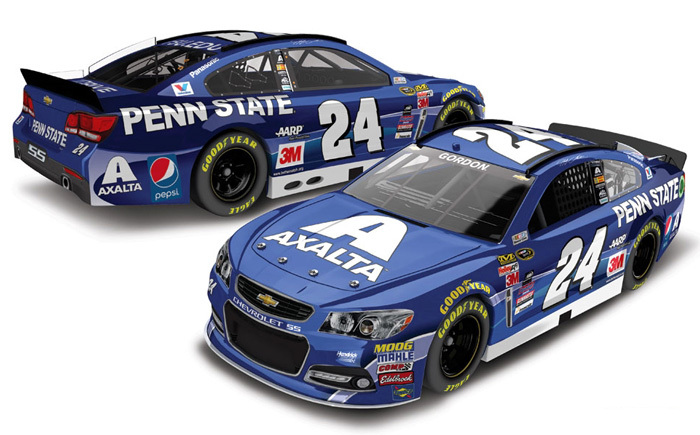 2015 Jeff Gordon #24 Axalta / Penn State / Chevrolet SS NASCAR diecast, by Action. 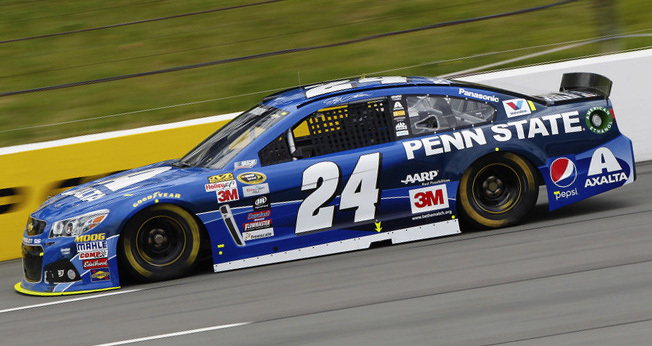 The Hendrick Motorsports #24 Axalta Penn State Chevrolet SS was raced by Jeff Gordon in the NASCAR Sprint Cup, Axalta "We Paint" 400 at Pocono Raceway on June 7, 2015. 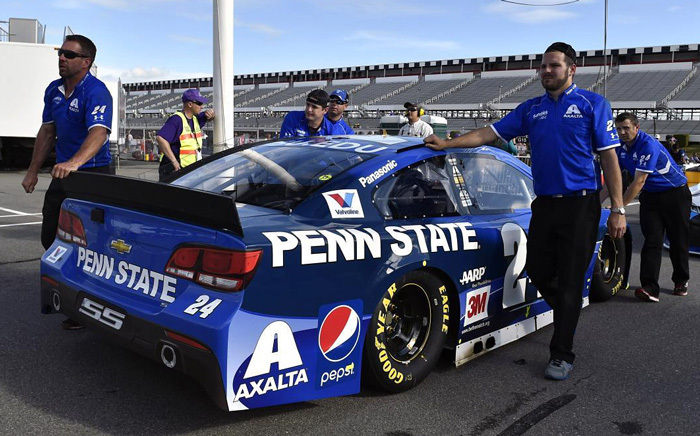 This car is painted in the Penn State University colors, blue and white. 2015 Jeff Gordon #24 Axalta Retro Rainbow / Chevrolet SS NASCAR diecast, by Action. 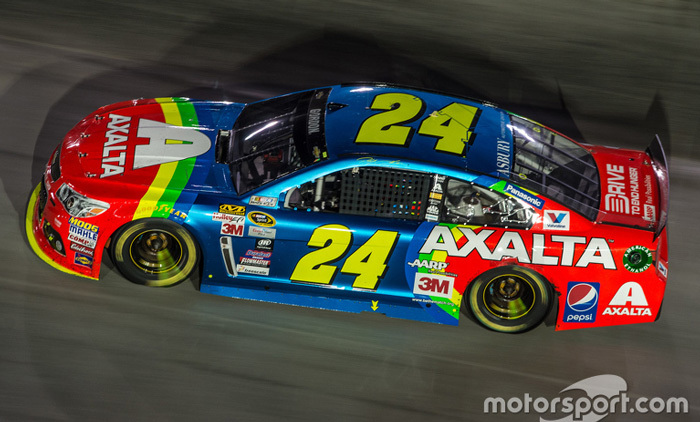 The Hendrick Motorsports #24 Axalta Retro Rainbow Chevrolet SS was raced by Jeff Gordon in the NASCAR Sprint Cup, IRWIN Tools Night Race at Bristol Motor Speedway on August 22, 2015. 2015 Jeff Gordon #24 AARP Ride with Jeff / Iron Man 789 / Chevrolet SS NASCAR diecast, by Action. 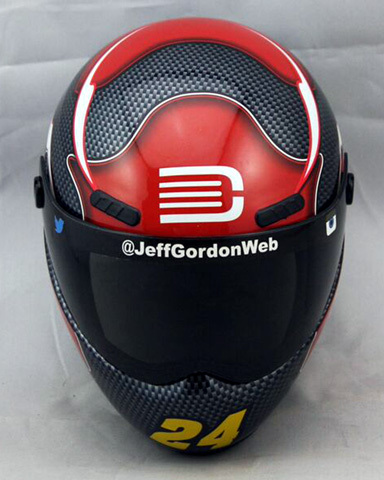 The Hendrick Motorsports #24 AARP Ride with Jeff Chevrolet SS was raced by Jeff Gordon in the NASCAR Sprint Cup, Sylvania 300 at New Hampshire Motor Speedway on September 27, 2015. 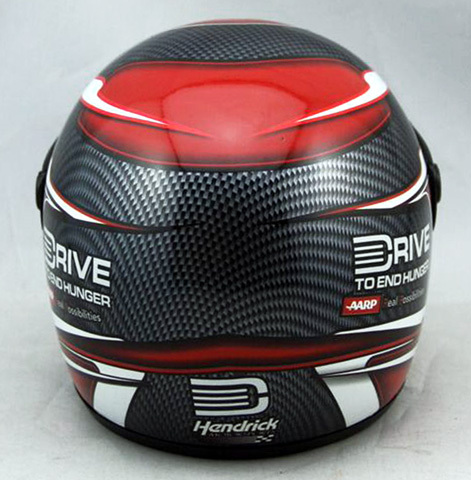 Gordon made his record-setting 789th consecutive start in this race, crowning him as the new "Iron Man" of NASCAR. To commemorate, the roof number has been switched to 789. 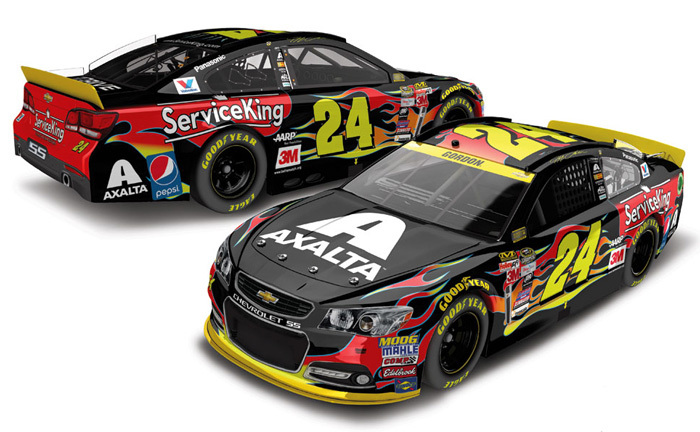 2015 Jeff Gordon #24 Axalta / Service King / Chevrolet SS NASCAR diecast, by Action. 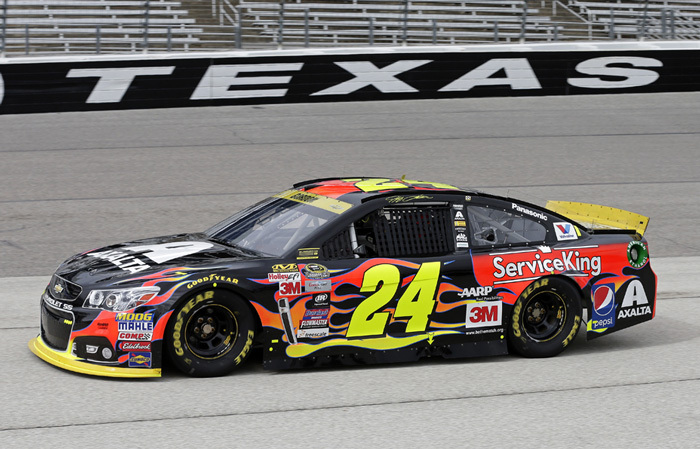 The Hendrick Motorsports #24 Axalta Service King Chevrolet SS was raced by Jeff Gordon in the NASCAR Sprint Cup, AAA Texas 500 at Texas Motor Speedway on November 8, 2015. 2015 Jeff Gordon #24 AARP Member Advantages / Martinsville Win / Raced Version / Chevrolet SS NASCAR diecast, by Action. 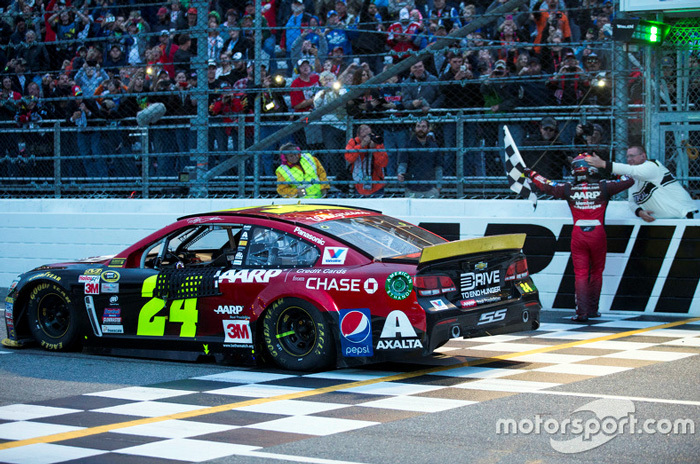 Jeff Gordon raced this Hendrick Motorsports #24 AARP Member Advantages Chevrolet SS to victory in the NASCAR Sprint Cup, Goody's Relief 500 at Martinsville Speedway on November 1, 2015. This car is also available in a Liquid Color version.